Fort McHenry, in Baltimore, Maryland, is a coastal star-shaped fort best known for its role in the War of 1812, when it successfully defended Baltimore Harbor from an attack by the British navy in Chesapeake Bay September 13–14, 1814. I actually didn't get out here because I had to take our little one to the hotel to nap, but our older daughter got to play on the cannons. Ok, this place is fun. Baltimore's Port Discovery Children's Museum has lots of things to do for a variety of age ranges. Kids can play store, sports, climb through an enormous tree-house, get soaking wet in a water room (that admittedly, I probably had more fun than they did while using boards to channel and dam the water flow), and even PBS exhibits like Sesame Street and Curious George sets. Kacey loves old ships. 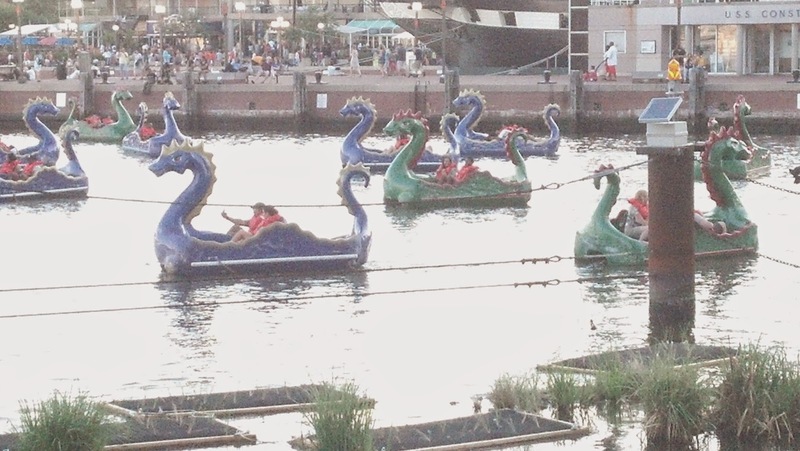 And since we're at the Inner Harbor, it seems fitting that we go aboard one of them. So we went aboard the USS Constellation. The kids loved it. Did you know that military personnel can see four ships for the price of one with valid ID? We would have done it if the kids weren't so close to nap time, but I thought I'd pass that along. Ok, so technically they are "Chessie", the Chesapeake Bay Monster. If you're looking for a unique paddleboat experience, look no further. Overall, Baltimore was a pretty decent weekend getaway from D.C. (but I would recommend going in late Spring or early Summer).